With the Clyde still closed to navigation, apart from local ferry traffic, few other vessels were moving today. The tanker BRO AXEL arrived at Finnart early this morning and Fisher's SUMMITY berthed in the Gareloch too. The container ship WERDER BREMEN arrived later this evening at Greenock. The two ships waiting at anchor for passage upriver were joined late yesterday by RANTUM, and during the night by KIELDER. 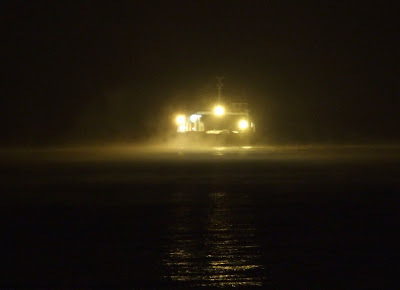 For most of the day, the Clyde was cloaked in fog, seen here enveloping one of Western Ferries vessels as she picks her way cautiously across the Firth. There is still no news of the three missing crew from FLYING PHANTOM, as a Marine Accident Investigation Branch inquiry into her loss gets underway. Meanwhile, this evening, news reports have suggested that there may be a limited re-opening of the river on Saturday, on a ship-by-ship basis.